This is a love story. Not the conventional kind, a boy-meets-girl romance; rather, it’s a novel about love—love of life, love of home and homeland, love of partner and family, love of fellow humans. So . . . where’s the drama, where’s the conflict, in a story about love and—as the title suggests—happiness? The author is an expert at answering this question. Best known for his No. 1 Ladies’ Detective Agency series, he brings intimate psychological dramas to both series, of which this is number ten of the Isabel Dalhousie novels set in Edinburgh, Scotland. Isabel is a rare breed these days: a philosopher, by both profession and inclination. She owns and edits the Review of Applied Ethics, and in all the rest of her waking hours, she thinks philosophical thoughts. This means she examines and questions issues great and small, always analyzing and deciding the right thing to do, then living with its consequences. Such a turn of mind makes her a kind person, who’s also a bit exasperating to those who know and love her. Each volume in the series revolves around Isabel helping someone with a personal problem. Usually she gets gently coerced into it and finds herself unable to refuse on moral grounds. So she minds that person’s business until reaching the heart of the matter and finding a viable resolution. This time around Isabel is called upon to investigate the claims of a young boy who believes he’s been reincarnated and perfectly describes a house and family where and with whom he lived. Simultaneously, Isobel learns that one of her professional nemeses, Robert Lettuce, is moving into town and may soon be trodding on her toes. But because of her vivid imagination and persistence in seeing the goodness in everyone, she is able not only to solve the boy’s mystery but also to learn important truths about Lettuce that change her heart toward him. Despite the book’s emphasis on love and happiness, it is not saccharine—nor is the series. It forms the continuing story of one woman’s life and the slant she takes on it, rolling through the types of ordinary experiences shared by ordinary people. These may seem trivial to outsiders but loom large and important to the people they happen to, and the author skillfully makes them important to us. In this regard the Isabel Dalhousie series parallels the Ladies’ Detective Agency series set in Botswana. Both form a stimulating thinking-person’s read, seeming light on the surface but actually going deep. 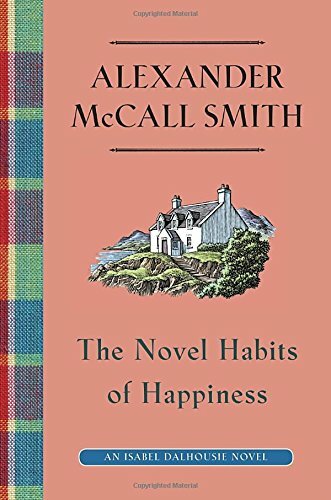 Readers of one series will likely enjoy the other, and The Novel Habits of Happiness is a stellar example of the type.